Andy and Deborah Cutter are the "Duxoup" people. They've been making obscure wines that only serious wine drinkers are interested in for about 25 years. Who in this age of Cabernet, Merlot and Chardonnay, would stick to making Charbono and Gamay? Who in this age of blockbuster wines, high in alcohol and loaded with oak would even think of making 12.5% alcohol wines that are not matured in highly-toasted, brand new French oak? Who would even consider selling wine from California for less than $20 a bottle? If you're guessing the Cutters at Duxoup, you've hit the nail right on the head! The 2009 Duxoup Napa Charbono, as usual, comes from the Frediani vineyard. It's got the typical blackberry/blueberry fruit notes you'll find in the few Charbono wines still on the market. We chided Andy about making wine that can actually be consumed a whole, entire bottle at a sitting since it's not 14-15% alcohol. "If the fruit is farmed right, you can get mature flavors without the extremely high level of sugar." Andy explained. This wine seems to taste good with practically anything, from Mediterranean fare to white meats to grilled or roasted red meats. We like it served a bit on the cool side, about 55-60 degrees. A few minutes of "breathing" (the wine, as well as yourself) seems to be beneficial here. Andy also makes a small amount of Gamay. Not a fruity, Beaujolais-styled red, this is a medium-bodied wine that's got a bit of backbone along the lines of a lighter Zinfandel. We "road-tested" this with a beef stew and it was right at home. Jim & Beth Summers are great practitioners of the art of Charbono. They grow their own and they grow it near the winery in Napa's Calistoga. This is dark in color and it'll stain your teeth...lots of beautiful boysenberry/olallieberry/blueberry aromas to this fairly full-bodied red. The tannin level is fairly modest and we enjoy this wine served at cool cellar temp. It pairs well with SO MANY foods...from picnic fare to Chinese food to roasted or grilled meats to chicken, pork, ribs, etc. Pavese founded his little winery in 1999, so unlike so many wineries in Italy that have hundreds of years of history, this guy's goes back just in the last century. The vineyards are high elevation, as high at 1200 meters! The grape of the area is a white variety called Prie Blanc and this grows in the shadows of Monte Bianco (Mont Blanc if you're on the French side of the hill). The vines are quite old and they're planted on their own roots...and they trained them fairly low to the ground because ages ago they were often picked by little people: the children of growers were often enlisted to pick the grapes during the harvest, so the vines, trained in a pergola style of cultivation, were kept low to the ground. Of course, the other benefit of this is what modest level of heat retained by the rocky soils would keep a bit of warmth for the vines in the night. Pavese vinifies this wine in stainless steel and it nicely retains a minerality we find quite enchanting. It's bone dry, low in alcohol (typically around 12.5%) and nicely crisp. It's a wonderful wine and one your friends are not likely to know since denominazione of Blanc de Morgex as there are but 30, or so, hectares of vineyards in this region. Pavese owns two of them. The name of the grape is "Uva Rara," indicating its a "rare" variety. But, in fact, there are approximately 1500 acres of it planted in Piemonte and Lombardia combined. What's rare is to find any of it bottled as a varietal wine and being sold here in the USA market. Now to totally confuse things, the Vespolina grape is known as "Uva Rara" and it's blended with Gattinara wines if the winemaker so chooses. In the Novarra-Vercelli hills, Uva Rara is known as Bonarda-Novarese, but some will tell you it's not the same grape as "Bonarda Piemontese." Well, this wine does not remind us of most Bonarda wines as it's lighter in body and tastes differently. The Brigatti winery produces a handful of wines and the total production tallies to a mere 20-thousand bottles annually. So, in their case, "Uva Rara" IS a rare wine! 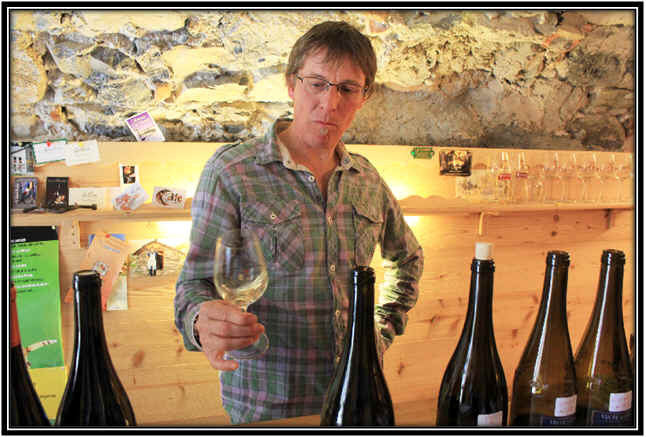 The Allies family has owned this estate since the 1980s and their son Guillaume and his wife now run the domaine. The winery and vineyards are in the town of Pomerols (not related to the Bordeaux town of Pomerol) and the family cultivates around 25 acres of a grape called Picpoul. In the local dialect, Picpoul translates to "lip stinger." The wine tends to be light in body, modest in terms of alcohol level and reasonably crisp, hence the 'lip stinger' designation. No oak. Dry. Crisp. Light. This is a remarkably good wine made from a grape known in the French Alps as Jacqu�re. The Qu�nard family has been making wine in the village of Chignin for several decades and theirs is a top example of the variety and, thanks to an honest importer, it arrives here at an attractive price. Our friend Lettie Teague, who writes wine articles for The Wall Street Journal, sent a note saying she thinks wines from France's Savoie region are going to be the "next big thing." We asked her where she's been the past decade? 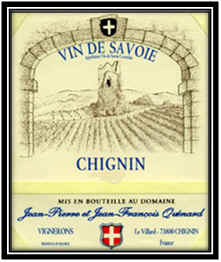 We've had a number of seriously good wines from the Savoie and the quality/price rapport is exceptional. This wine comes from vines averaging about 40 years of age. Chalky/clay soils in mountainous vineyard sites...the wine is done in stainless steel and then left on the lees for a brief period before bottling. It's not terribly high in alcohol (another feature we find refreshing!) and there's a mildly minerally note with a touch of a hazelnut quality. It's a nice aperitif wine, but really shines when paired with seafood. Dungeness Crab is a great partner, but so are Sea Scallops, prawns or white fish filets. A bottle served with some Rex Sole was really enjoyable, too.